In a previous blog I described the amazing KiwiSDR network of online receivers. A quick check of the network as I write today's blog shows that there are presently 207 active online receivers distributed throughout the world! Over the past year, there has been a growing interest in using many of the online receivers during the monthly CLE NDB listening events, all focused on the medium frequency (MF) part off the spectrum just below the AM broadcast band. 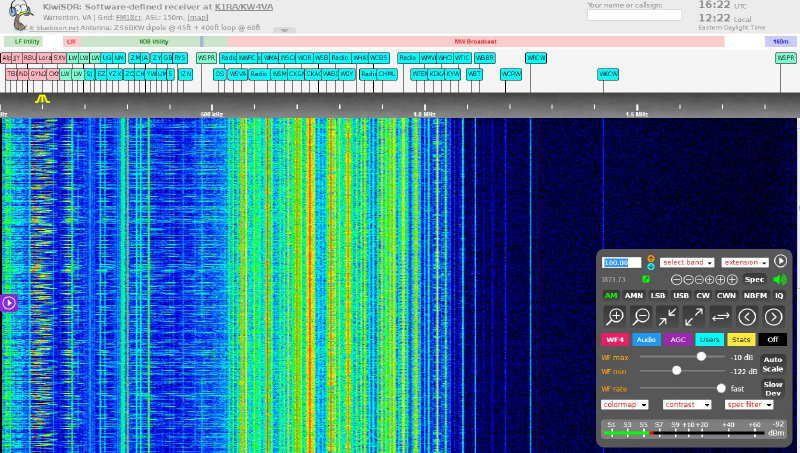 Some use the SDRs to search for unlogged beacons while others use them because their home locations have become too noisy to hear anything using their own radios, a growing problem for listeners everywhere. One ardent NDB DXer, Dan Petersen, W7OIL, (located in Vancouver, WA) has become a regular Kiwi network user as well as a regular contributor to the very valuable RNA / REU / RWW list of worldwide beacon activity. Over the past year, Dan has been keeping careful notes on not only what he has been hearing but also on how well many of the online radios perform on the MF NDB band. As it turns out, many receivers perform very well on the HF bands but are dreadfully inadequate when it comes to the medium wave frequencies. Many are plagued with high noise levels, switching power supply signals, intermod or inadequate antenna systems, making them unusable for weak signal DX work below the broadcast band. Other receivers however, are superb performers, as evidenced by their quiet low noise locations and well engineered antennas, providing the ideal opportunity to conduct some serious medium wave weak signal detection. Dan has now produced the start of an ongoing guide, mainly focusing on the various Kiwi Network receivers that he has tested, rating them with regard to sensitivity and local noise, when used in the 200 - 500 kHz range only. His SDR EVALUATION LIST (in .pdf form) can be downloaded from here, and will be updated periodically, as other online receivers are evaluated. If you are plagued with local noise on the MF band yet would like to do some weak signal DXing, especially during the monthly NDB CLE activities, the online SDRs may be of interest to you. With Dan's helpful groundwork already giving you a leg up, hopefully you can give them a try sometime soon! 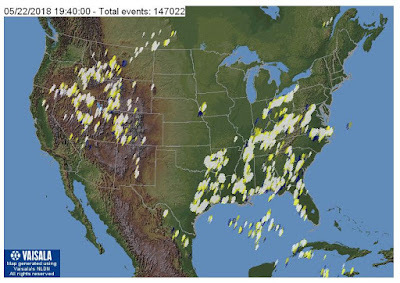 Speaking of monthly CLEs ... the recently completed weekend event (CLE232), was a rough one, with worldwide lightning noise as well as an active geomagnetic field hampering reception for all participants. In North America, all three nights were terribly noisy and propagation was poor. As is so often the case, Friday night was the 'best' of the three nights but only 18 stations were heard here. My log is shown below. It was nice to hear POA in Pahoa, Hawaii, still going strong as it is located close to the present volcanic eruptions. 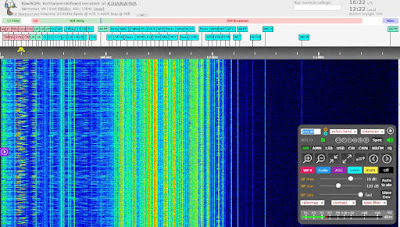 All signals were heard on a Perseus SDR feeding an inverted-L antenna, resonated to 300kHz. This coming weekend will see another monthly CLE challenge. This time the hunting grounds will be 320.0 - 334.9 kHz. A nice challenge in this one is to hear the Arviat NDB, located in Nunavut on the western shores of Hudson Bay. 'YEK', on 329 kHz runs 500W into a 100' vertical and it's well-heard throughout North America and many parts of Europe under the right conditions. 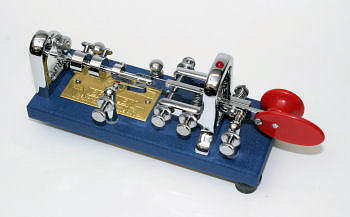 Listen for its upper-sideband CW identifier (with your receiver in the CW mode) on 329.421 kHz. Propagation has been very good on the MF band recently but at this time of the year, good listening is often hampered by a lot of lightning activity. Hopefully that will not be the case this coming weekend but today's map shows what we may be up against! If you are interested in building a system for the new (U.S.) 630m band, the CLE will give you the chance to test out your MF receiving capabilities and compare against what others in your area might be hearing. For example, 'AA' near Fargo, ND, transmits on 365 kHz and its upper sideband CW identifier is tuned at 366.025 kHz while its lower sideband CW ident can be tuned at 363.946 kHz. Its USB tone is actually 1025 Hz while its LSB tone is 1054 Hz. Our next Co-ordinated Listening Event is less than a week away. America, may hear a few, but please don't report them in this CLE. If you are interested in some remote listening - maybe due to local difficulties - you could use any one remote receiver for your loggings, stating its location and with the owner’s permission if required. A remote listener may NOT also use another receiver, local or remote, to make further loggings for the same CLE. Final details can be found at the NDB List website, and worldwide results, for every participant, will be posted there a few days after the event. The Yahoo ndblist Group has been moved to Groups.io and The NDB List Group will now be found there! The very active group is a great place to learn more about the 'Art of NDB DXing' or to meet other listeners in your region. There is a lot of good information available there and new members are always very welcome. As well, you can follow the results of other CLE participants from night to night as propagation is always an active topic of discussion. You need not be an NDB List member to participate in the CLEs and all reports, no matter how small, are of much value to the organizers. Remember - 'First-time' logs are always VERY welcome! Reports may be sent to the NDB List Group or e-mailed to CLE co-ordinator, Brian Keyte (G3SIA), whose address appears above. If you are a member of the group, all final results will also be e-mailed and posted there. 'CQ BR' - It's "Bug Roundup" Weekend! Ever since earning my ticket as a teenager back in '63, almost all of my on-air activity has been focused on CW ... I've always loved it. Back when I first got on the air there were very few amateurs using keyers. Most used bugs and the remainder used hand keys. It was very easy to tune across the band and identify any of the locals just by the sound of their fist ... like snowflakes, no two were the same. The same went for most stations that were very active. DX or otherwise, one could usually tell who it was, long before the call signs were sent. So much has changed now with the almost exclusive use of electronic keyers and everyone pretty much sounds the same, which is rather unfortunate I think. Once my interest in building vintage-style vacuum-tube transmitters evolved, my interest in bugs was reactivated and over the years I have purchased a few more. I'll do everything I can to promote and encourage the use of CW and especially hand-generated CW. That's why I was excited, once again, to read a recent e-mail from W6SFM, posted to several lists that I read, announcing the Bug Roundup! In the same spirit as ARRL's Straight Key Night, participants are encouraged to make simple, conversational, “chewing-the-fat” QSOs using their bug type key. This is an opportunity to exercise, share and exhibit your personalized fist. This is NOT a contest. However, there is a very easy and quick registration form found at https://w6sfm.com/bug-roundup/. Once you've optionally registered for the event simply Call "CQ BR" so folks know you are a Bug Roundup Participant. So lets grab that bug, clean those contacts, and let’er fly! We want to hear that “Banana Boat / Lake Erie Swing" or that commercial KPH/WCC quality fist. Sounds like a fun event and I'll have a tough job deciding on which bug to use but it'll probably be the 'Original' this time out. 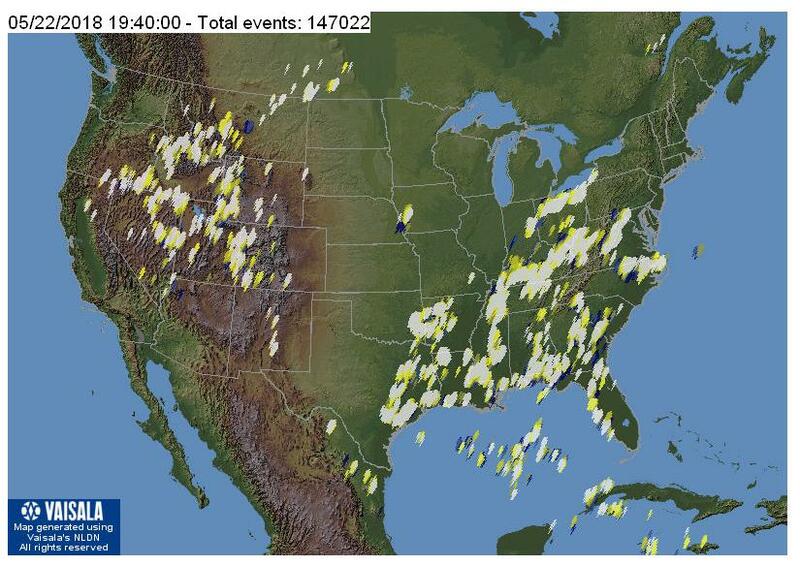 Please see if you can squeeze-in a few hours of nice old bug-generated CW as the present digital craze is taking a big bite out of conventional CW activity it seems. Hopefully this is only temporary! 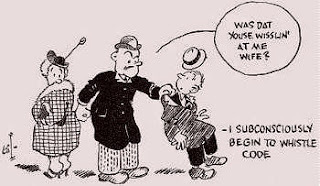 For some reason, the FCC continues to pour money into its hell-bent roundup of FM pirate broadcasters! I suspect much of this 'tough stance' is more politically motivated than for the reasons that they state, but the FCC seems to have plenty of will-power and the necessary funding ... it's too bad that they couldn't put the same zeal into getting on top of or making a start on the huge growing noise problem throughout the radio spectrum. I guess rounding up pirates is much easier than tackling the far more important noise issues, now growing so rapidly that many radio amateurs just throw up their hands in surrender and close up shop for good. Even commercial users of the spectrum are being negatively affected by the growing noise floor, as the growing Internet of Things connected devices produce even more radio crud. It now seems that the FCC may get a further boost in its crackdown if a new bipartisan proposed federal law becomes reality. A May 9, 2018, article in Radio World reports the tabling of the new bill in the US Congress called the PIRATE Act or "Preventing Illegal Radio Abuse Through Enforcement Act". It would also be nice to see the PAIN Act (Preventing All Illegal Noise) in the RF spectrum but I see no Washington appetite for this much-needed FCC oversight. The continued obsession for rounding up FM pirate broadcasters is fascinating in its own right. 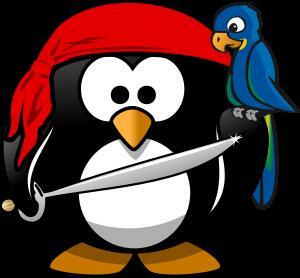 "It is time to take these pirates off the air by hiking the penalties and working with the Federal Communication Commission on enforcement", stated Rep. Leonard Lance (R-NJ). "As reported in Radio World, the PIRATE Act proposes to hike the fine for violations to as much as $100,000 per day, with a maximum fine of $2 million. The rules currently allow the FCC to impose a maximum daily penalty of about $19,200 per day. At a Congressional hearing on the bill in March, New York State Broadcasters Association President David Donovan told lawmakers that illegal operators are undermining the nation’s Emergency Alert System, causing invasive and insidious interference, pose potential public health problems due to overexposure to radio frequency radiation, and interfere with airport communications." It is apparent from reading investigative reports, that each acted-upon complaint requires a substantial investment of time and money as in the April 24 Notice of Apparent Liability for a case in Paterson, New Jersey ... it seems that NJ and NY are 'pirate hotbeds'. By the end of the investigation, a team of fully-equipped FCC field agents had visited the pirate's site(s) on eight different occasions, a considerable investment in time, energy and money. In the end, a $25,000 penalty has been proposed for the offender. I am not a fan of illegal pirate radio broadcasting in any form but the reasons stated by the FCC for the ongoing pirate purges seem somewhat shaky. In all of the investigative reports that I've read, I have yet to find any that were reported to cause "interference with airport communications" and I question the assertion that the low power levels used by most pirates are going to "pose potential public health problems due to overexposure to radio frequency radiation". One more likely reason may be the strong lobby pressure from broadcasters who see the possible loss of advertising revenue. I'm sure that many Washington electees receive healthy campaign donations from state broadcasters as well. Although many pirate radio ops seemingly solicit advertising revenue, overall it can't be much of a threat to mainstream broadcasters. Is it just the NAB Washington lobby that is fuelling the FCC pirate craze or is it muscle-flexing from the new administration, wanting to look tough on "crime" and radio-pirates are just easy low-hanging fruit? I suspect that it may be more of the latter. The FCC's 'Pirate Action' postings make for interesting reading as does the fascinating Westword article on pirate radio activity in Ward, Colorado, and the recent attempted FCC take-down of stations in operation since 1997! There's no question that a lot of FCC resources are being used to eliminate unlicenced QRM. What will it take to see the same attack on unlicenced QRN as well?